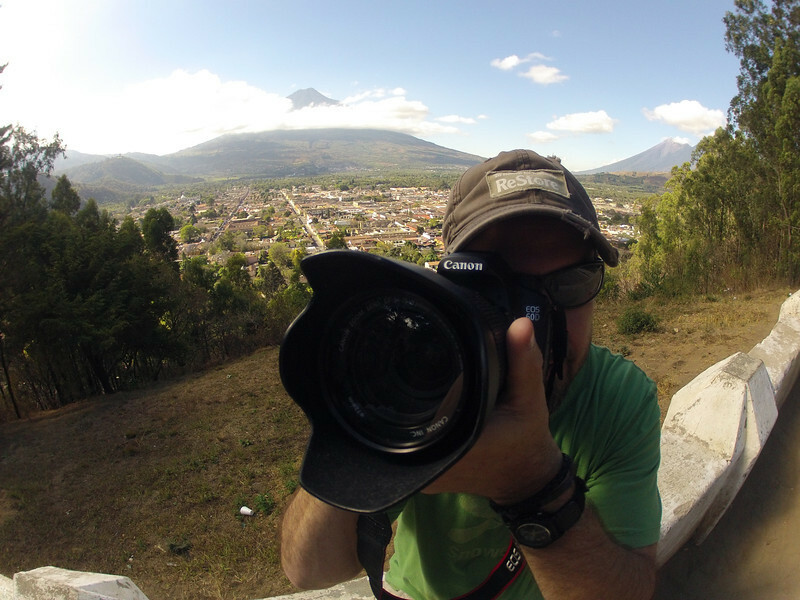 A GoPro Goes To Guatemala: This is a story about the little camera that could. 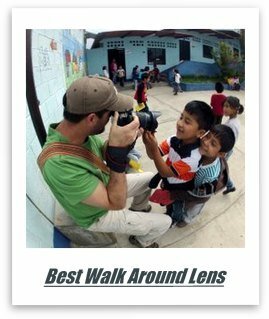 In 2013, I went to Guatemala to cover the fair trade coffee business with my friends at Cafe Campesino. We drove into the clouds to meet small coffee farmers who earn pennies for their back breaking labor. Think about that the next time you drink coffee. After a couple of weeks of traveling through remote areas and discussing everything we could about coffee and how best to trade it fairly, the rest of our group headed back to the states. My wife and I stayed the rest of the year in Guatemala. 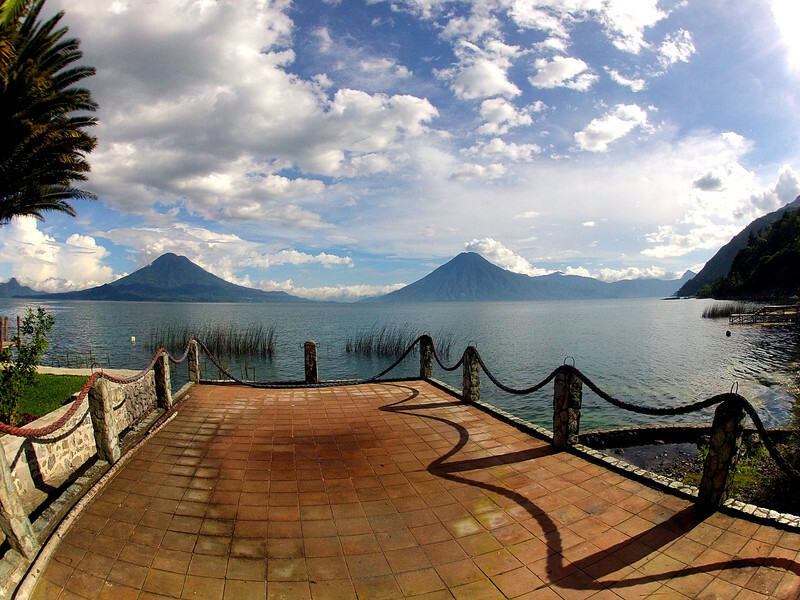 We lived in Antigua and in several areas around Lake Atitlan. 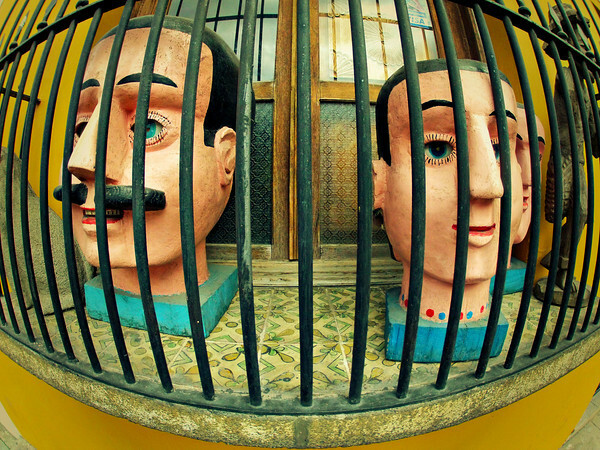 What follows are pictures taken with my GoPro Hero2 during our time in Guatemala. The GoPro turned out to be a great travel/street camera. Its small size allowed me to walk around somewhat unnoticed (no big camera and lens hanging off my shoulder). 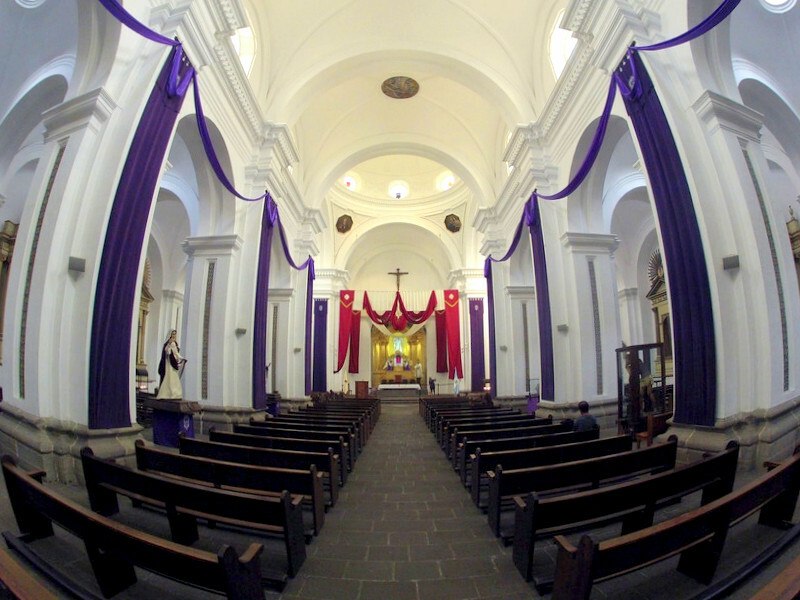 The GoPro's wide angle lens was extremely valuable walking through markets or churches or just trying to capture everything my eyes were seeing. 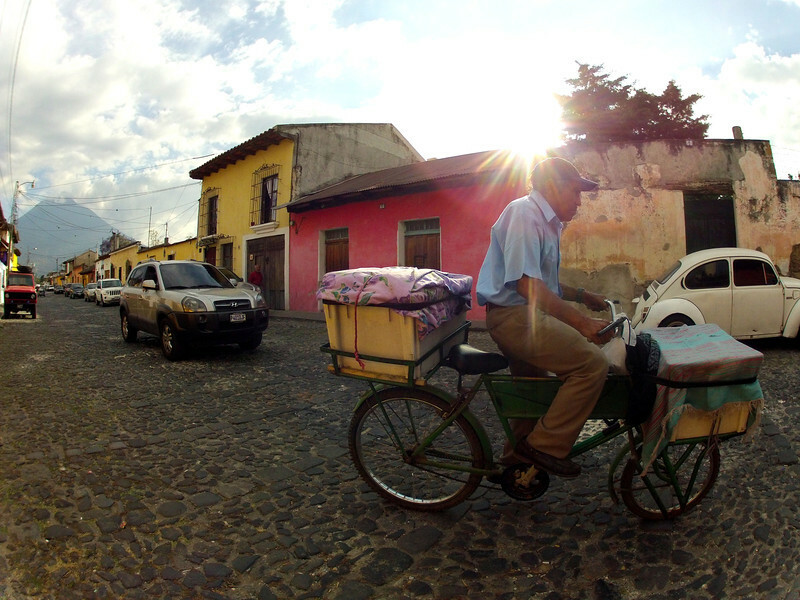 Above: Taken on the streets of Antigua, this picture has become one of my favorites. I like how the fish eye lens of the GoPro works with the round shape of this Beetle. 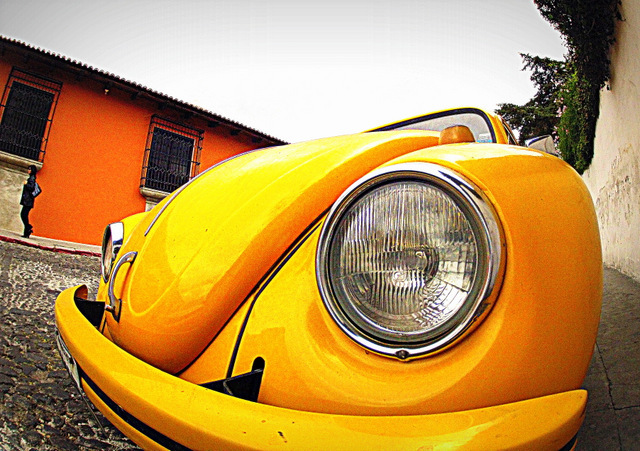 This picture has inspired me to create an entire series of pictures of GoPro Beetle pics. 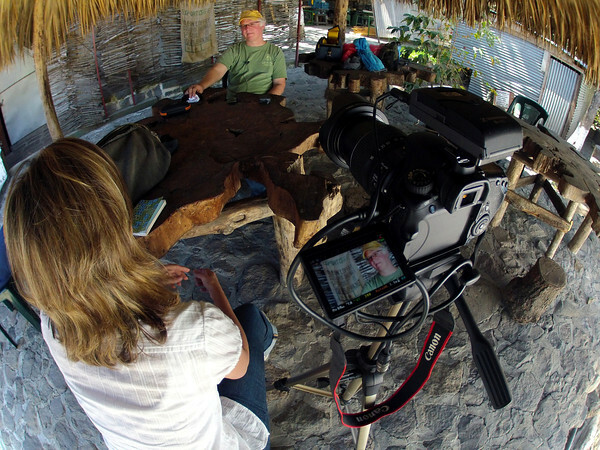 Above: This is our set up during one of our interviews while still on the coffee tour. Bill Harris, founder of Cafe Campesino, answers questions about the fair trade coffee business in Guatemala. 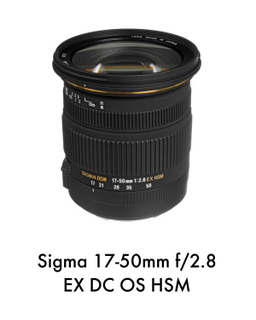 In case you were wondering, the video is being shot with a Canon 60D and a Canon EF 15-85mm f/3.5-5.6 IS USM lens. We are using a wireless Sennheiser wireless lav plugged directly into the camera. You can see this interview in a video I made for Cafe Campesino after the tour was over. You'll see a number of video clips shot with my GoPro in the video as well. 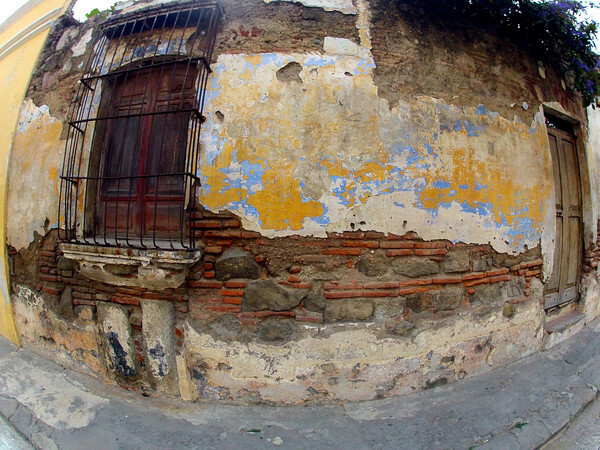 Above: Another shot from the streets of Antigua. If you are ever walking around Antigua, pay close attention to the window sills. Some of them stick out a few feet into the sidewalk and if you are not careful, you will knock your head against concrete and rod iron. I passed these guys everyday on my way to Spanish class. 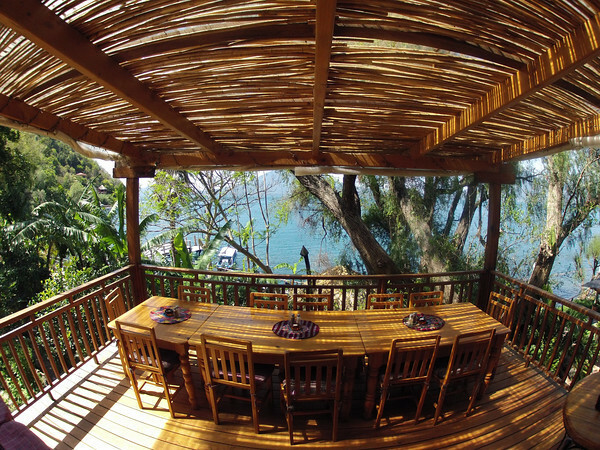 Above: If you are interested in visiting Lake Atitlan, be sure to go to Villa Sumaya in Santa Cruz. This hotel/yoga retreat has incredible views of the lake and incredible food too. 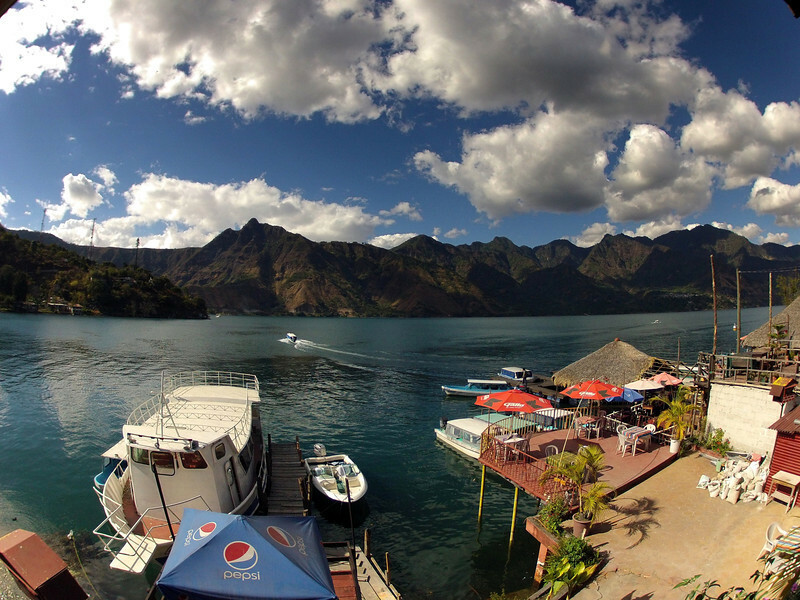 Above: Lake Atitlan is the most beautiful lake in the whole entire world. I haven't been to every lake, but I doubt many other lakes come close to the beauty of Lake Atitlan. 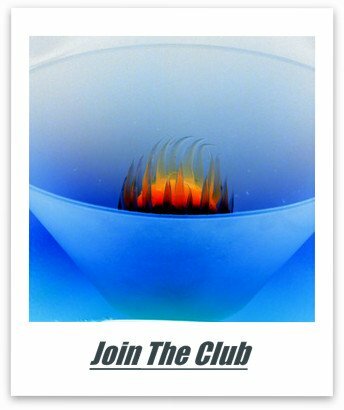 It was once described by some famous writer who traveled the world and commented on what he saw as "too much of a good thing". 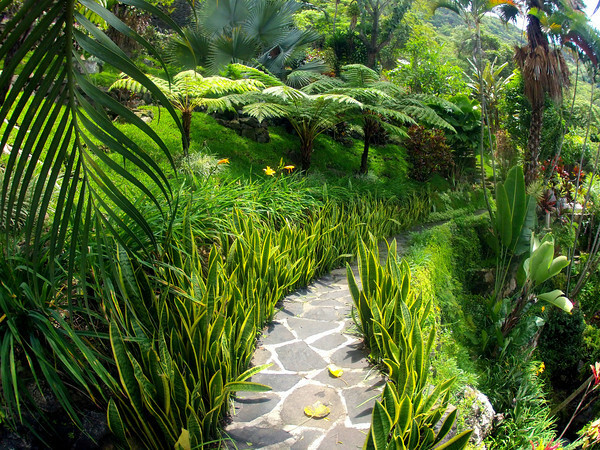 Above: Here's more of "too much of a good thing" from Lake Atitlan, The vegetation can be overwhelming at times. The GoPro Hero does a great job of bringing in almost everything your eyes can see. Above: Even the dogs at Lake Atitlan can be overcome by the beauty of the lake. 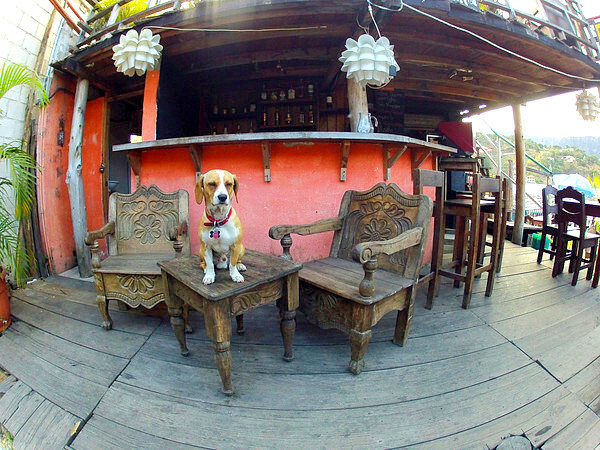 This pup is sitting at a bar in San Pedro right off the docks. I'm sure he is thinking "this is so awesome" or "bacon". Above: Antigua is a bustling town. There's always something going on. There's a mix of old and new everywhere you look. Pictured here is a food delivery cyclist taking an order to some lucky guy's house. Above: Back to the calming charm of Lake Atitlan. You can faintly see two of the volcanoes off in the distance. The volcanoes are about 5 miles away. Above: While Lake Atitlan offers more peace and tranquility than anyone deserves it lacks the cosmopolitan nature found in Antigua. 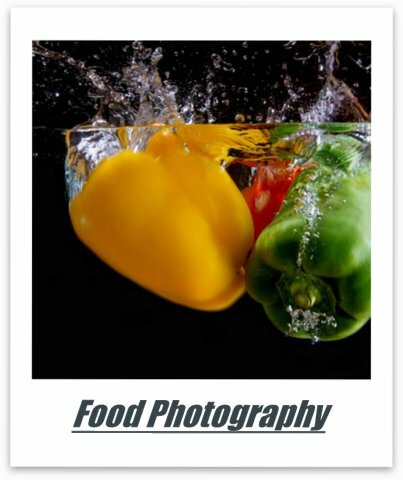 If you are a foodie, (and who isn't?) Antigua offers world class cuisine to suit every taste bud. Unfortunately for me, this table was reserved for someone else. Above: The docks of San Pedro at Lake Atitlan. 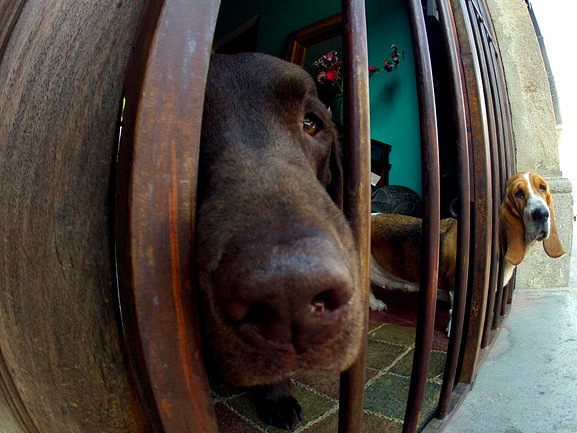 The GoPro Hero's fish eye lens captures everything brilliantly. 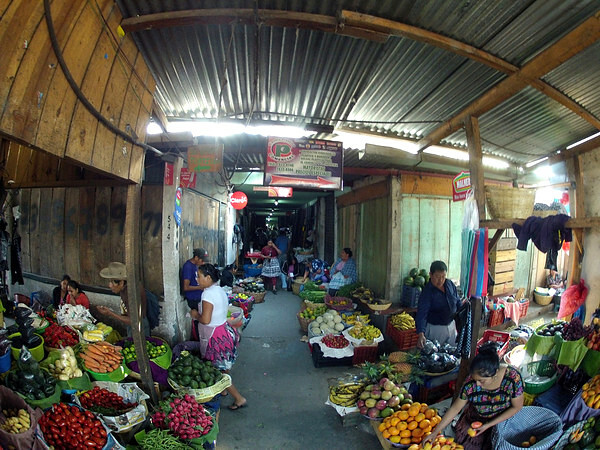 Above: If you find yourself in Antigua, you have to visit the local market. We first entered the market by walking through a coat rack in a small store just outside the market. I promise you, we walked through a rack of coats and found a magical world of everything. It was like The Lion, The Witch and The Wardrobe. I love this picture because it shows you can buy fish and bras from the same vendor. 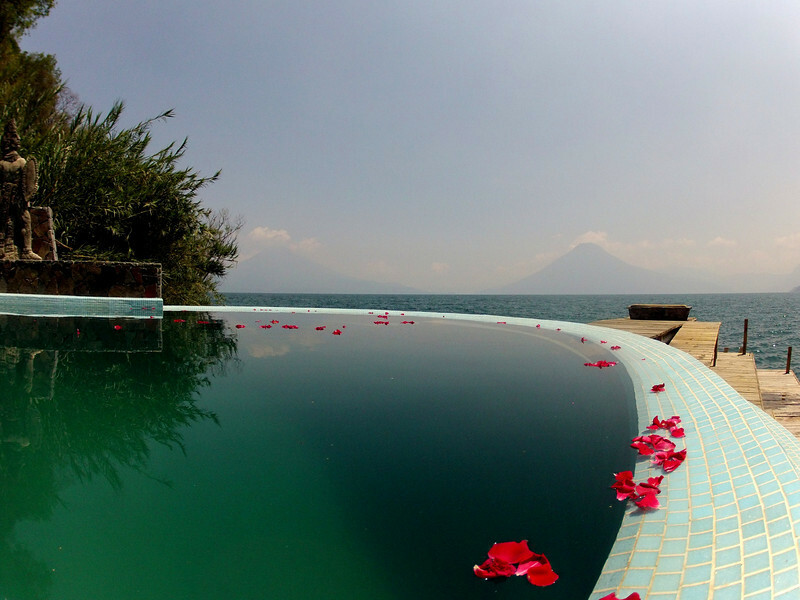 Above: Relaxing at Lake Atitlan comes as second nature once you've gotten adjusted to the beauty. 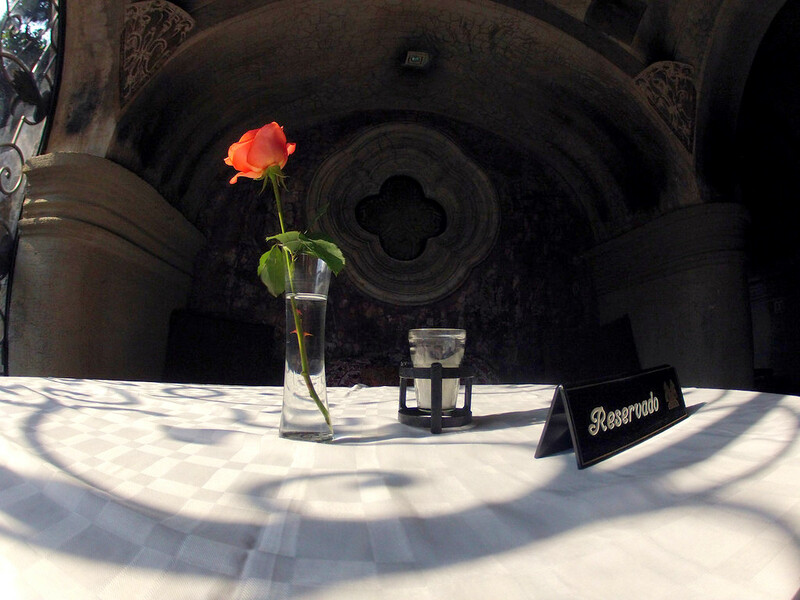 Above: When taking pictures with your GoPro Hero, look for curves. 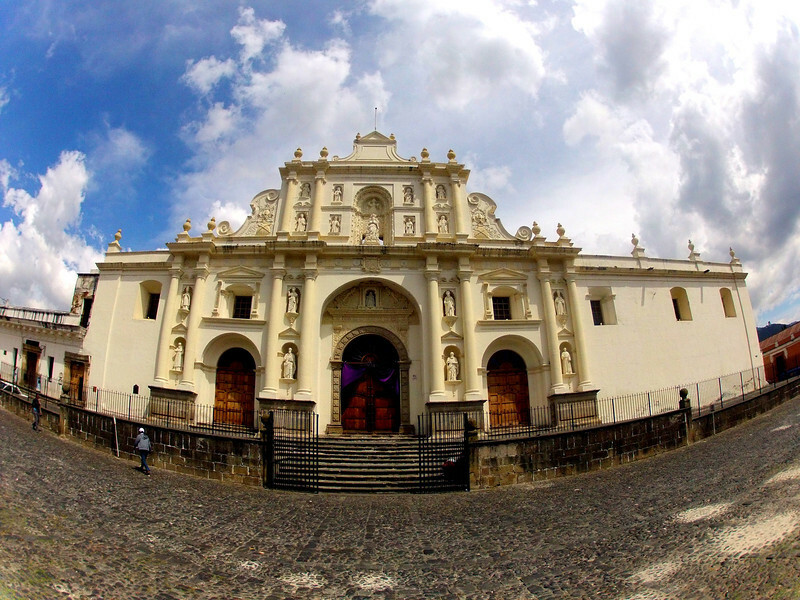 The fish eye lens wraps itself around the arches found in Antigua. 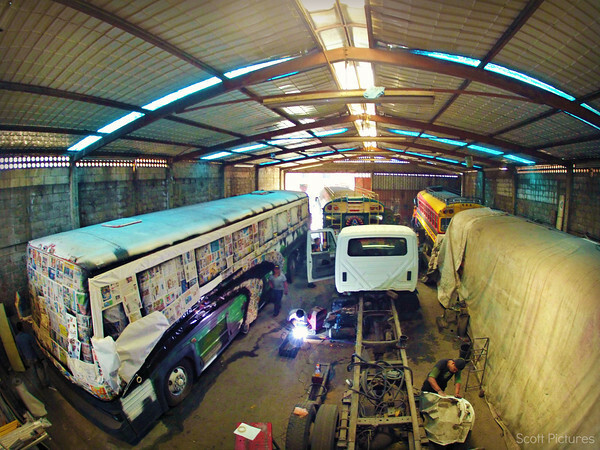 Above: This is a shop where chicken buses are born. Retired school buses from the U.S. are driven down to Guatemala and reconfigured to accommodate the general public. Chicken buses are the most popular means of transportation in Guatemala and chicken bus drivers have one of the most dangerous jobs in Guatemala. From driving through hair-pin mountain roads to paying off gangs to pass through certain areas, chicken bus drivers live on the razor's edge. 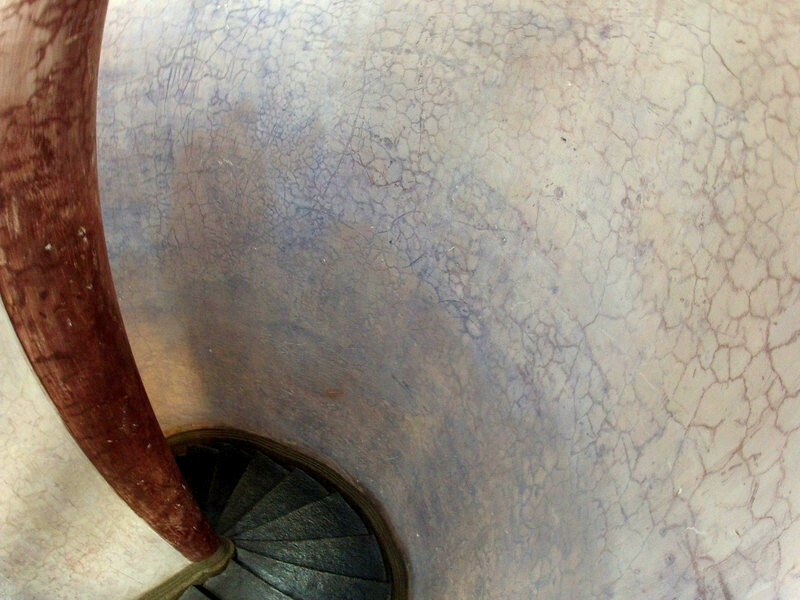 Above: Antigua has a rich history and you can see a lot of it by counting the layers of paint and plaster that have been chipped away over the years. Notice the window sill just waiting to bang somebody's head. 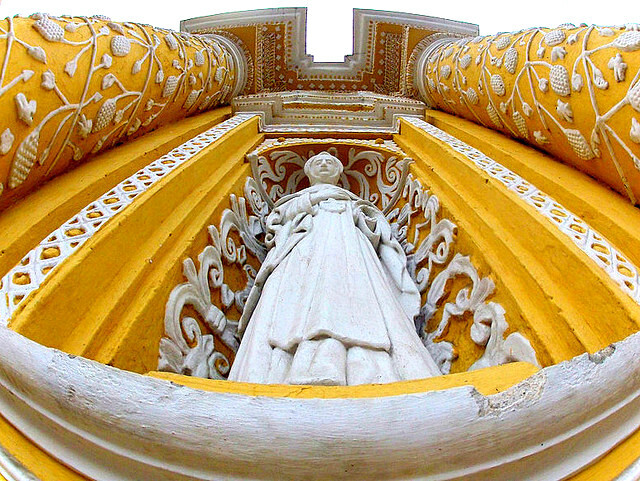 Above: Another amazing thing about Antigua is that the old saying, "Don't judge a book by its cover." holds true for doors too. Never assume you know what is on the other side of a door in Antigua. 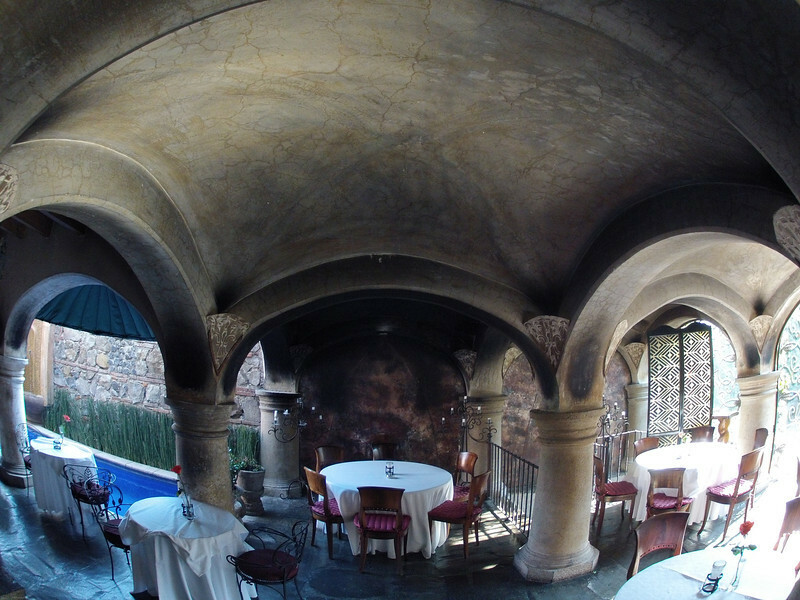 You can walk through an old, worn out door and enter a world class restaurant. 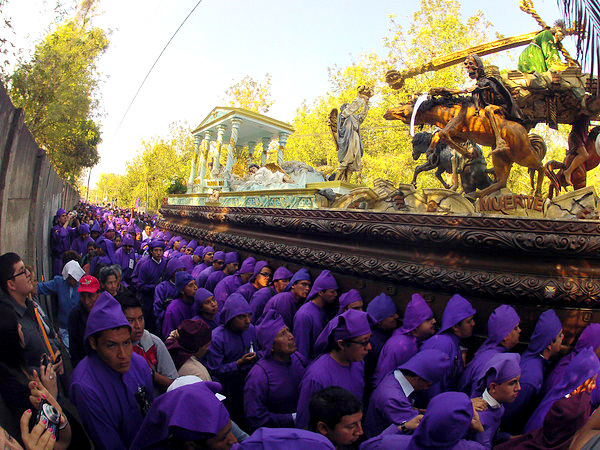 Above: Holy Week (Semana Santa) in Antigua is a big attraction for people from all over the world. Processions occur for an entire month with fireworks and general ruckus all leading up to Easter when Antigua is over come in a sea of color and people. Above: A sampling of what you will find inside the local market in Antigua. 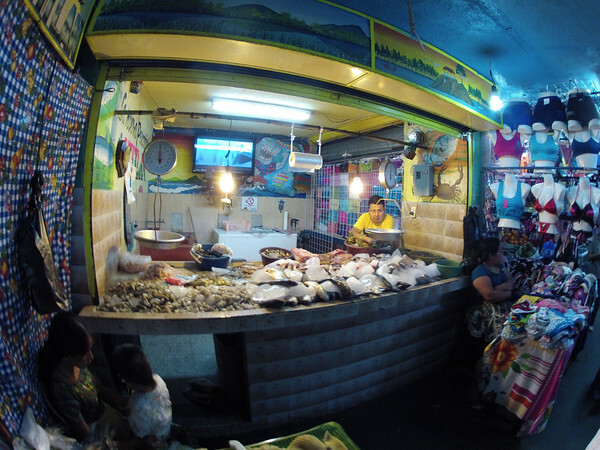 Space is tight in the market and the GoPro Hero does a great job of capturing more of what you see. Just make sure you give your GoPro plenty of light. Above: Another example of how the GoPro Hero can create cool pics if you find the right curves to go with its fish eye lens. You can see that the flower in the foreground is out of focus. 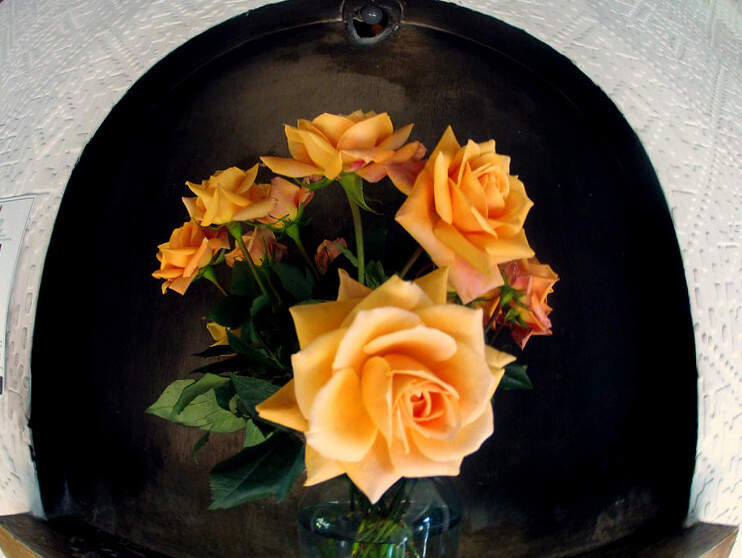 For this shot, the camera was just a few inches away from the lead flower. You can see that the GoPro found its focus with the flowers in the background. You can get very close to your subject with the GoPro, but sometimes you can get too close. I should have pulled back another 6 inches or so to get all of the flowers in focus. Above: Taken from Central Park in Antigua. If you give your GoPro plenty of light, it will give you plenty of great pictures. 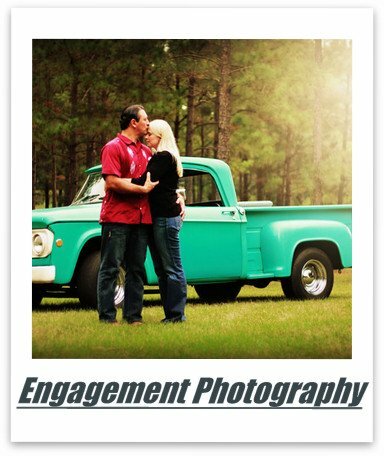 Your cell phone or any other point and shoot camera would never get the entire church into frame. Above: Again, the super wide angle of the GoPro Hero captures pictures that you simply cannot get from any other point and shoot camera. 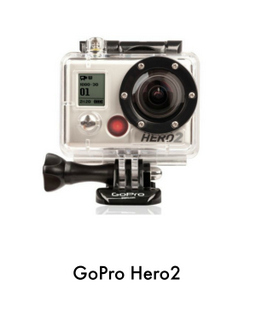 When traveling, the GoPro is vital if you expect to find yourself in tight or otherwise confining areas. 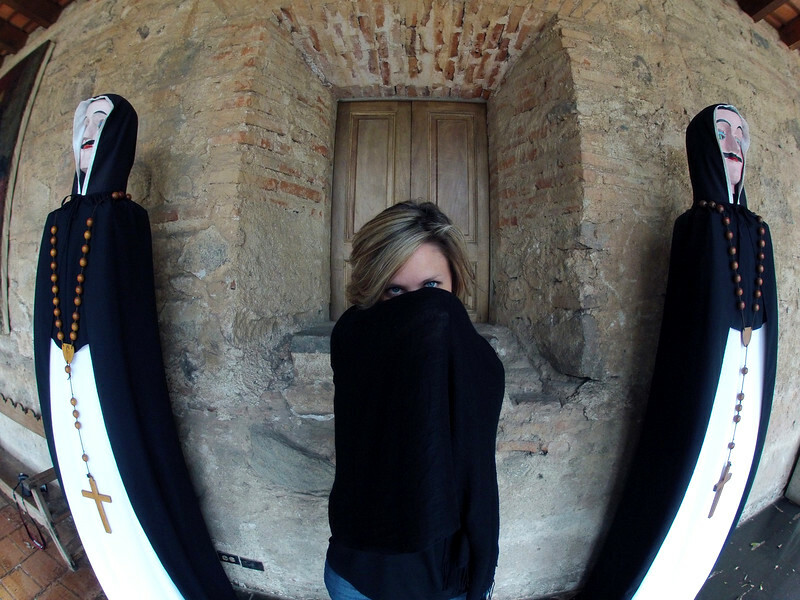 Don't travel without a GoPro. Above: Once you get the hang of shooting with the GoPro you learn how to spot interesting shots that you could not get with any other camera that fits in your pcoket. 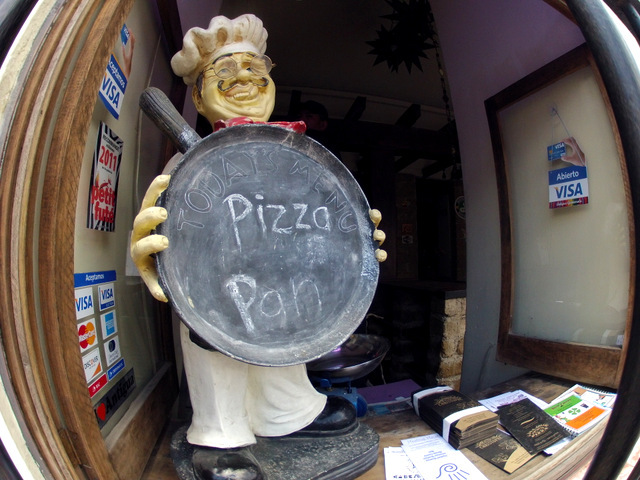 Above: Yes, they have pizza in Antigua. And yes, they take Visa and Mastercard too. 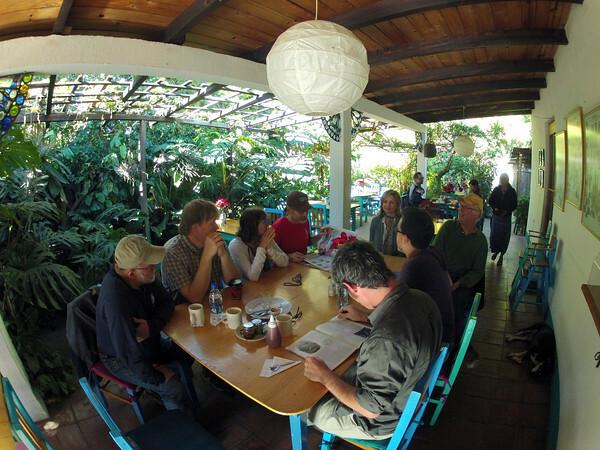 Above: Here's our group from the coffee trip. I added this picture to show you that when traveling the GoPro Hero comes in very handy when you don't have a lot of room to back up. 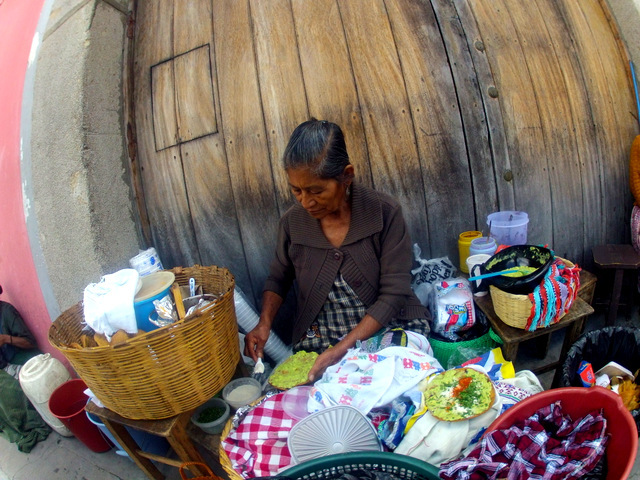 Above: If you, and your stomach, are up for it, you can get some great local food right off the streets of Antigua. I got this shot as I walked past this woman preparing food. I didn't even look as I hung the GoPro down around my leg when I pressed the shutter. I knew that the wide angle was certain to bring everything into frame. My only concern was how fast the shutter would be. 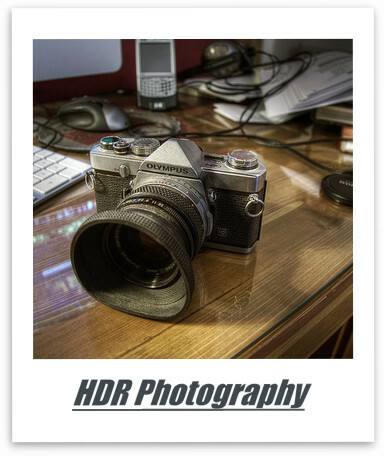 Since the GoPro is a point and shoot camera you are sometimes at its mercy with regard to exposure settings. Above: Dogs like GoPros too. 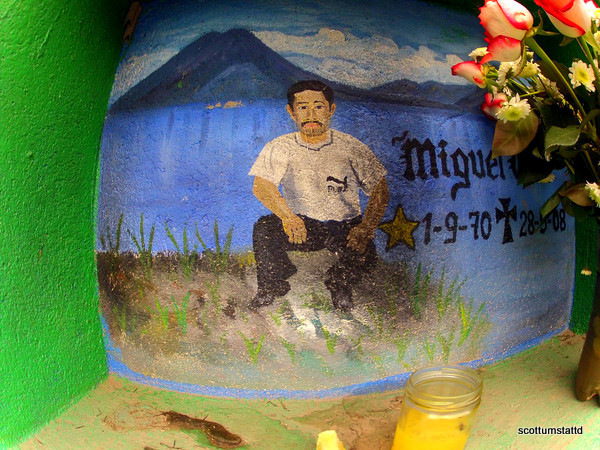 Above: This is a grave marker at a cemetery in the town of Panajachel at Lake Atitlan. 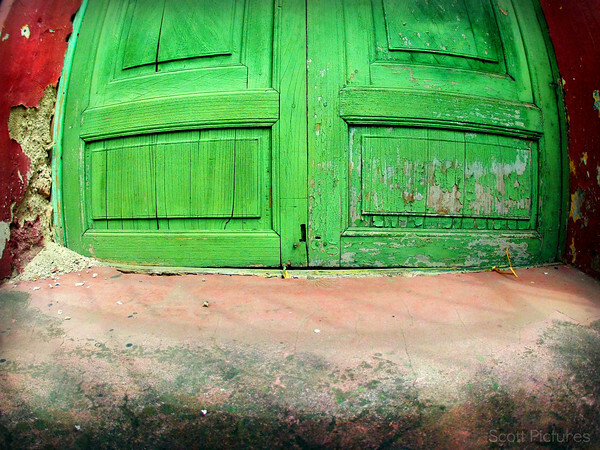 You can see plenty more shots like this in another article A GoPro Captures A Colorful Cemetery. 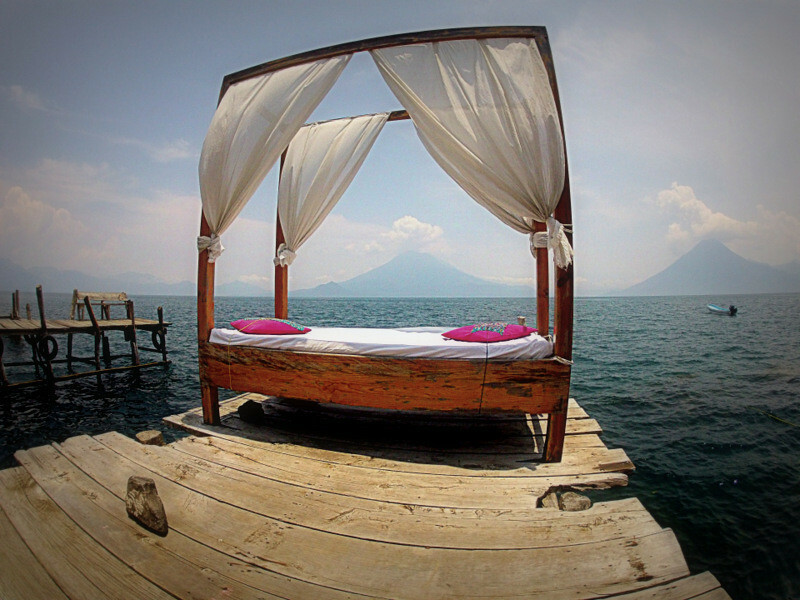 Above: Just another bed on a dock over looking volcanoes. 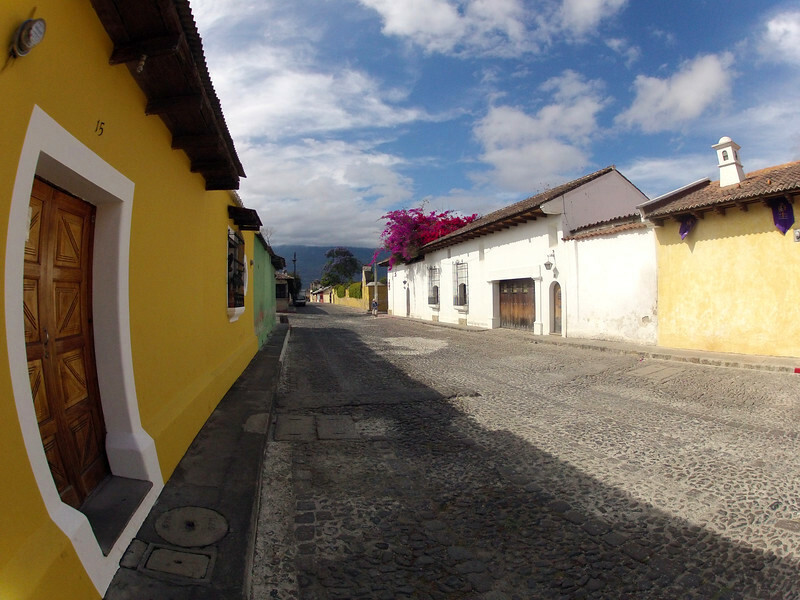 Above: It took some patience, but I was able to get a picture of an empty street in Antigua. 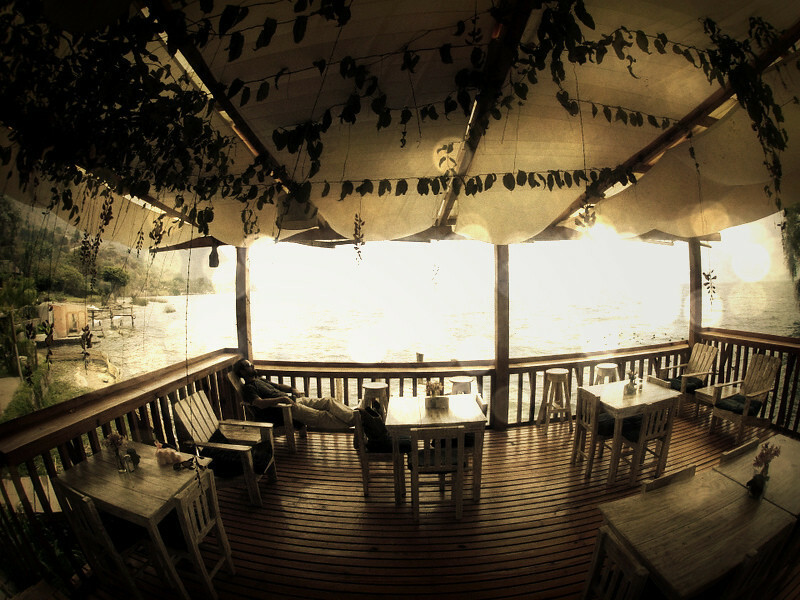 Above: Not every picture I take is with my GoPro Hero2. 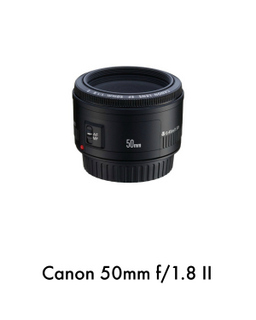 Here you can see my Canon 60D with the Canon EF 15-85mm f/3.5-5.6 IS USM lens. That is Antigua and Volcano Aqua in the background. Above: Here's my beautiful (and mysterious) wife posing with two of her friends in Antigua. Above: Finally, you can buy hot pants at the market in Antigua. 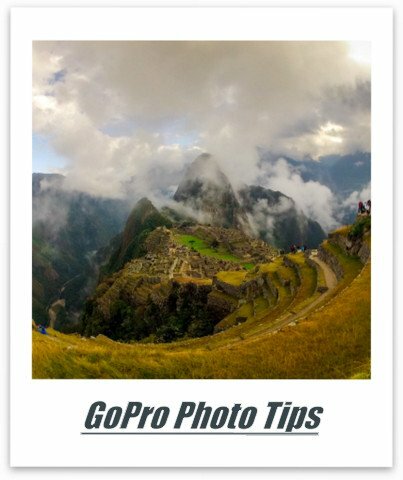 Now that you can see why the GoPro Hero is an excellent camera for travel, check out another article and get some GoPro Hero photography tips so that you won't miss out on any of the fun.